One of the great things about having a well-stocked Kindle is that you don’t need to think too much about what books to take away with you on holiday. You can finish a book and just pick whatever takes your fancy next instead of having to guess in advance just what you might feel like reading on a plane, on a beach or in your hotel. For my recent trip to Istanbul I had actually downloaded a couple of novels set in the city but then got the urge for something completely different – in this case a very funny account of one man’s introduction to India as a result of following the England cricket team on the 2001 test series. 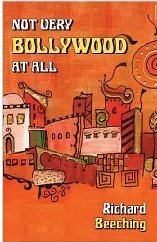 The book is Not Very Bollywood At All by Richard Beeching. I’ve read very good and very bad Kindle ‘books’ about people’s experiences of travelling in the country that I love and this is one of the best so far. I fear that the advent of easy ‘blogging’ and relatively easy e-book publishing has led a lot of people – many of whom should probably have kept their travel experiences for the eyes and ears of long suffering friends and family – to launch themselves onto the market as ‘travel writers’. Many produce dull dull dull accounts of the minutiae of the traveller’s day or show themselves up to be extraordinarily ignorant about the places they’ve visited. Richard Beeching is not one of those people – he’s funny, he pays attention and his observations get right to the point of what it’s really like to travel on a budget in the world’s biggest democracy. He’s absolutely, painfully honest about just how crap life can be in between the sublimely brilliant bits and that’s why I’d recommend Not Very Bollywood At All to anyone considering independent travel in India for the first time. He’s one of those writers who manages the very English trick of being horribly funny whilst seemingly trying hard not to be. I would want to have a beer with this man and talk about trains and toilets – honestly! Whilst my interest in cricket is minimal, I found Beeching’s ‘first time in India’ observations to be so authentic and so understandable that I warmed to his tale very quickly. This isn’t really a book about cricket – cricket is just his reason for chucking in his job, leaving his divorce behind him and going off to do something different. He’s not one of the dippy hippies off to find an ashram and search for themselves – instead he’s a very English ‘bloke’ accidentally tripping over himself between test matches. The organisers of the 2001 test series were not kind when they set the locations for the matches. The tour could so easily have taken in some of India’s great cities but it didn’t. With the first test in Chandigarh (a soulless place that’s a lot like Milton Keynes – Beeching calls is ‘an architectural abortion’), the second in Ahmedabad (an alcohol free city thanks to its association with Gandhi and a predominantly Muslim one, visited at the time of growing tensions with nearby Pakistan) and the last one in Bangalore, the most boring big city in the sub-continent. If these three places had formed my first introduction to India I think I wouldn’t have gone back. Equally the cricket was unexciting with India winning one test and the other two ending in draws. When the tour was over Beeching decided to stick around, partly hoping to get romantic with a Welsh television producer who needed some advice on the laws of cricket and would be around for the One Day Series, but also because something about India had got under his skin. He just wasn’t ready to go home. I suspect nobody was more surprised than Beeching. He claimed he went to “watch England play cricket, go beserk in Goa and then leave”. He hated his life and “fancied doing bugger all for a year”. At one point he wonders why the locals are staring at him and another traveller, whilst totally ignoring an old man masturbating over a display of bananas. That’s the authentic voice of Indian travel experience. He learns to see the beauty in the dirt. When a guy from Hounslow tells him that Amritsar is a dirty, smelly city full of hassle, he replies that it’s “a dirty, smelly, bustling, vibrant city built around the most beautiful serene and spiritual experience you could wish for in a city of 2.5 million”. He is – as you probably already guessed I would say – right on the button. That’s exactly what it is. He’s less generous about Ahmedabad – that’s a “horrible place full of horrible people”. I’ve not been so I can’t confirm – but the reason I’ve not been is because I’ve heard it’s a horrible place full of horrible people. He does admit that quite possibly not all of the 5.7 million inhabitants are horrible but “the 500 or so I (met) were mainly a***holes”. Miscellaneous observations that made me giggle included watching tiny ants carrying away dead mosquitoes as he sat in the bathroom suffering a bout of diarrhoea. Actually rather a lot of funny bits relate to (squat) toilet humour. Having to wipe himself with 10 rupee notes, having a serious attack in a teepee and having to poo in a shower when the end of the corridor was just beyond his reach. It’s not for the faint-hearted or weak of bowel. Similarly his feelings about monkeys are impossible to repeat without the use of more asterisks than letters. He doesn’t like them – really doesn’t like them. His account of taking drugs in Jaiselmer – the notorious combination of ‘bhang lassi and bangh cookies’ – reminded me of what my friend Alex got up to during our visit to the city although at least Beeching wasn’t daft enough to send a tuk tuk driver off with his ‘bhang money’ and to expect him to return with the ‘goods’. He fights off unofficial tourist ‘guides’ who “spoke excellent English but struggled to comprehend “No””. At one point he tests his theory that no Indian will ever admit they don’t know where something is by walking a couple of blocks from his hotel and then stopping people to ask for instructions. Everyone waggles their head and tells him where to go. The only one who doesn’t claim he’s sure of the way is the only one who actually gives the correct directions. It’s just all SO true. I laughed, I grunted, I bored those around me by reading out snippets, and when I got to the end of the book I wanted more – much more – but there was no more to be found. I wanted to know who Richard Beeching was and whether he’d written anything else. And then it hit me that maybe he doesn’t exist at all. After all Baron Richard Beeching was the man who shut down so may of Britain’s railway lines and our Not Very Bollywood At All Richard Beeching spent 71 days travelling around on India’s railways. I’m left wondering if it’s just a nom de plume – an alias created to protect his identity from all the people he might have offended on his travels (or all the budget hotel owners whose accommodation was left less than sparkling clean). On the basis that there are no more than half a handful of reviews of this e-book online, I’d love to ask Richard Beeching (or whoever he is) to kindly drop me a note and let me know if he exists and if I can find any more of his travels available in print or on line. This fantastic little e-book will set you back a mere 77 of your English pennies and will possibly – if you are anything like me – make you laugh until others question your sanity. If you’ve ever been to India, every wanted to go or even never shown the slightest interest in going, and if you have an open mind and can see the humour in upset bowels, this is a bargain. Go, buy it now. No Comments on "Not Very Bollywood At All"